Statistics are compiled for many uses, what we need to do is use this information to inform, prevent and control. With this in mind we decided to put some statistics into an information flyer and use the “Spotlight on…” theme to raise awareness with our delivery drivers on the growing issue of cyclist safety. 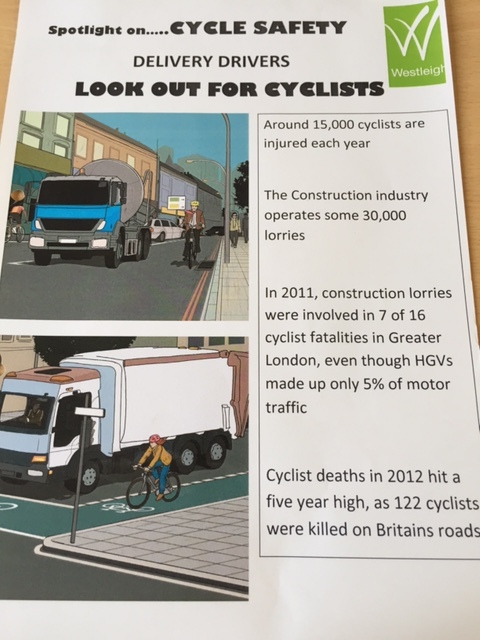 We devised a handout based on the 2012 all time high of cyclist fatalities and hand this out to drivers who delivered to us, we also coupled this with more recent statistics, and whilst the number of fatalities has fallen, the number of those injured has risen. The majority of our deliveries are made by FORS registered companies which shows a commitment to be audited in compliance with the scheme and we checked that lights, beacons and reverse warnings where all working. A newer warning to aid cyclists is an audible speech warning of which way the vehicle is turning at a junction, we have this on our refuse collector. Human error is the main contributory factor for drivers and cyclists. From a high of 122 fatalities in 2012 there where 107 fatalities in 2015, but the total of injured has risen. Construction accounts for 30,000 deliveries on the highway. 75% of injuries occur in urban areas. Failing to look properly is the top cause of accidents. 75% of all fatalities have suffered a head injury.